Leaf Guards Madison, Gutter Covers | I.G.S. Perhaps you have thought of having leaf guards installed on your home in the Madison area of Wisconsin. Also called gutter covers, gutter protectors, gutter protection systems, or gutter toppers, gutter leaf guards actually do more than just keep out debris and prevent it from creating clogs. 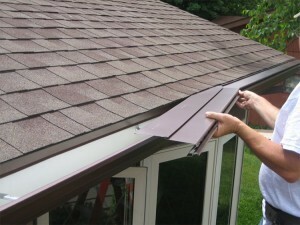 In doing so, they also eliminate a chore – gutter cleaning – that is inherently dangerous. According to the Centers for Disease Control and Prevention, nearly 50 percent of all fatal falls in the United States involve a fall off a ladder. Climbing a ladder to clean debris out of your gutter system is thus an activity that can all too easily wind up with you taking a trip to the hospital. Isn’t it good to know that having leaf guards installed can keep you off a ladder and out of harm’s way? Contact Innovative Gutter Solutions today if you live in the Madison, WI, area and think you might like to invest in Absolute Gutter Protection – a gutter cover that outperforms all the others on the market. Other products available from Innovative Gutter Solutions or one of our many dealers include seamless gutters, gutter outlets, downspout extension hinges, and downspout extension clips.